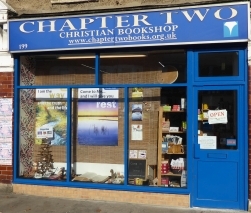 An excellent range of Bibles, books, greeting cards and many other Christian products is available at our bookshop. You are invited to visit and browse around the shop! Special Offer: Free book with all Bible purchases! With every Bible purchased at the Chapter Two Christian Bookshop you will get one free copy of Hugo Bouter's Bible Characters! This offer is only available to our customers at the Bookshop and not for customers ordering online or through our mail-order department. If you are travelling a distance, please telephone before to avoid disappointment. All our staff are volunteers and our hours of business are by their courtesy. The nearest rail station is Woolwich Arsenal which is served by the Docklands Light Railway from Bank and by Southeastern from Charing Cross, Cannon Street and London Bridge. From Woolwich Arsenal Buses 51 & 53 pass by the door of the bookshop. If you come by car, you will find free parking nearby. Click here for some of our Chapter Two publications as pdf files.